The Machines Worksheet – Download the best FREE science activities worksheet for kids about Machines. This science activities worksheet includes a fun find the missing word search as well as a hidden words puzzle game for kids. Kids will enjoy to learn fun facts about machines through this worksheet. The machine worksheet is both free to download and print. Our easy science activities worksheet about machines is ideal for kids in Preschool, Kindergarten and Grammar school from First Grade to Fifth Grade. Primary school & Grammar school kids can use this free science activities about machines as a reading comprehension worksheet. By needing to find the missing words the kids will have to read and re-read the fun facts about machines information and thereby enhance their reading comprehension and science knowledge. Preschool kids and Kindergarten kids who can’t yet read and write can use this fun free science machines worksheet as a listening comprehension tool. Parents or Educators can read the facts about machines out loud and then help their kids in finding the missing words. Young kids can also play the word seek puzzle and learn to recognize letters and words. Teachers and Educators can use our free to print science activity worksheets to supplement science lessons and after school enrichment programs. EasyScienceforKids.com is the best online science kids resource for the best free science activities worksheets, hidden word games and printable word search puzzle games. This printable word puzzle about machines will show kids how machines can be used to make work and life easier. Machines are used for many different uses. Some can be used for simple or complex work. Even your refrigerator or blender you use at home is a machine! Learn more fun facts about machines by downloading the free machines worksheet! 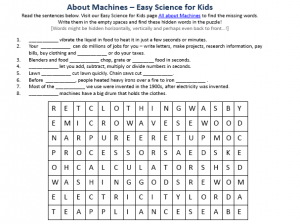 [sociallocker]Get the Fun Free Science Activities Worksheet for Kids about machines. Download the FREE Machines Worksheet for Kids! Did you like the fun FREE Machines Worksheet? For lengthy info about machines, click here. Declan, Tobin. " Machines Worksheet - Best Free Science Activities Worksheet for Kids - ." Easy Science for Kids, Apr 2019. Web. 21 Apr 2019. < https://easyscienceforkids.com/machines-worksheet-best-free-science-activities-worksheet-for-kids/ >.